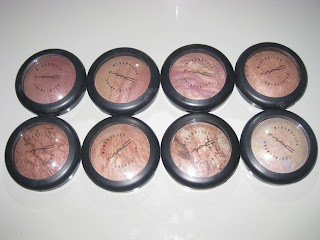 Ive become a little addicted to M.A.C Mineralized Skinfinishes..I love all baked things but these take the cake. They look so gorgeous in the pan. Right now im really loving Perfect topping & Lighscapade.Which one is your favorite? 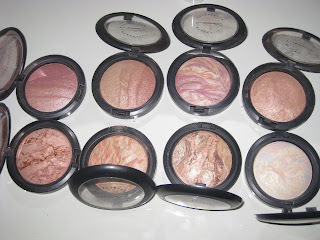 -Blonde,redhead,perfect topping,glissade,light flush,refined,goldspill,and the glorious lightscapade.I also have petticoat not pictured,and plan on getting most from the colour craft collection..woohoo!